If you need a saucepan to cook the rice the “Woll Diamond Plus Saucepan" can do a perfect job – because this saucepan really has diamonds, making it a beauty to conduct heat. To prepare the Puebla style rice you can use the “Westbrae Natural Golden Corn"; it has good texture, good flavor and the best is that it is organic. If you want to venture in planting Poblano peppers the “Cornucopia Poblano Pepper Seeds" are for you. You will only need a sunny garden and in 80 days you will have your Poblano peppers. Here we have a tasty recipe from the state of Puebla – and when Puebla is mentioned in the Mexican food, you have to get ready because it is a fact that you will taste a delight. Puebla is very famous for its exquisite culinary art . The Puebla style rice is a white rice that changes of color to a beautiful green color , with the help of a salsa made of Poblano pepper. This salsa makes the rice have more flavor, a spicy touch and an exquisite Poblano pepper aroma. 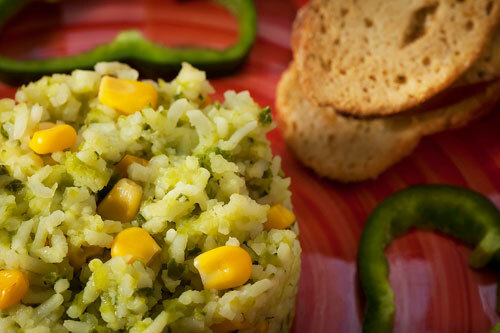 – This rice also has golden corn , which gives to the dish some notes of sweetness and a beautiful color contrast. As a good rice it is an excellent appetizer , it can be served plain or accompanying diverse dishes. If you put it with green dishes like the chicken in green pipian it looks divine and if you put it with red dishes like a pork in adobo the contrast looks appealing. To make the Puebla style rice you will go through a ritual with the Poblano pepper then everything is easy to make. Don’t be afraid about the rice, just follow the “golden rule" for each cup of rice use 2 cups of liquid or broth. It is recommended to use a thick saucepan so the rice doesn’t burn and not too tall so the rice has the best consistency. The golden corn, that is used in this recipe, can be bought canned. Put on a griddle over medium-high heat 2 Poblano peppers and roast them for about 4 minutes, until all their sides are completely black; move them regularly with some tongs. Transfer from the griddle to a plastic bag, with the tongs, the 2 Poblano peppers that were roasted. Take from the plastic bag the 2 Poblano peppers and rinse them while removing the outer skin of the chilies (the burned part). Discard the seeds and the veins of the Poblano peppers that were rinsed. Upon completion put them in a blender. The rice has to brown so it acquires well the green color. The 2 cups of Green Salsa that were measured. 1/2 cup of canned Golden Corn Kernels. When the cooking is done turn off the heat and leave the Puebla style rice resting for about 4 minutes, until the rice grains absorb the moisture and are loose. with a Very Original Color! Tip: Prepare some tasty corn tortillas to accompany your rice. Suggestion: Put some panela cheese chunks to the Puebla style rice, you will love the combination of flavors. Variation: Let’s change the Puebla style to... Mexican rice. Did you like the Puebla Style Rice?